Peterborough Northern Star recorded their first home win of the year yesterday (February 21) - the day after they sacked co-managers Darren Jarvis and Michael Goode. The club announced on Friday that Dominic Genovese would be in charge for the ChromaSport & Trophies United Counties League Premier Division game against Newport Pagnell but it was Tommy Roberts and Jonny Clay who stood in to lead Star to victory at the Mick George Arena. Josh Sanders came off the bench to score the vital goal three minutes into added time. Andy Law suffered a broken nose in the build-up to the goal. With Yaxley and Holbeach both without league games yesterday, Wisbech Town seized the opportunity to go second in the table by winning 4-1 at Long Buckby. Tommy Treacher put the Fenmen ahead after 13 minutes and Adam Millson scored the next two after 18 and 21 minutes, his second from the penalty spot. Danny Beaumont scored Wisbech’s fourth a minute into added time at the end of the first period. Deeping beat Northampton Sileby Rangers 2-1 at home thanks to a sixth minute penalty by Spencer Tinkler and a header from substitute Ian Ward a minute past the hour-mark. Huntingdon Town lost 7-3 at Wellingborough Town. Their scorers were Antonio Douglas, Chris Jones and Ben Colmer. Holbeach kept their hopes of a league and cup double alive with a 4-3 League Cup win over Olney Town. But they needed extra time to dispose of lower grade Olney. Livo Dube, who scored twice in the first five minutes, went on to complete a hat-trick for Tigers with Matt Warfield booking Holbeach a home quarter-final against Potton with the decisive goal in extra-time. Peterborough Sports returned to the top of Division One with a 1-0 win at Wellingborough Whitworth. Sports went ahead three minutes into the second half when half-time sub Matt Cook’s penetrative pass picked out Andy Boome’s well timed run in behind the defence and he finished with aplomb. Bourne went goal-crazy at Irchester United. A stunning second-half display from the Wakes saw them win 6-0 to avenge a heavy home defeat by the Romans on the season’s opening day. Harley Williams made the 47th minute Bourne breakthrough and further goals were added by Henry Dunn, Scott Spearink (2), Joe Bull and Josh Hales. Blackstones held Division One title favourites Northampton Spencer to a 1-1 draw thanks to a Declan Carr equaliser. In the Evo-Stik League Northern Premier Division, Stamford drew 3-3 with visitors Trafford. Ryan Robbins (2) and Courtney Meade scored the Daniels goals. 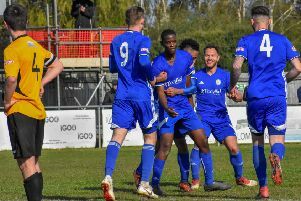 Matt Nolan snatched a 75th minute winner for Spalding as they beat Sutton Coldfield Town 1-0 at home in Division One South.